For about 30 years, Dr. Alexander Beider focused on the origin and evolution of Ashkenazic names and the vernacular language in Eastern Europe. He has now drawn his attention to surnames of the Mediterranean region—mostly Sephardic— and has published the first volume of his research: A Dictionary of Jewish Surnames from Maghreb, Gibraltar, and Malta. The book identifies nearly 2,000 independent root surnames from which more than 10,000 variant surnames are derived. A typical entry contains three sections: Main, Origin and Variants. • The Main section identifies the surname and spelling variants (in both Latin and Hebrew characters), where in the region it was used, earliest references, and bibliographic source of the information. There are nearly 300 sources from which Dr. Beider draws his conclusions. • The Origin section includes an identification of bearers of the name as having a single common ancestor (monogenetic) or multiple independent ancestors (polygenetic). This is followed by the etymology—the linguistic origin of the name. • Finally, the Variant section shows the main variants of the name that exist in the region. 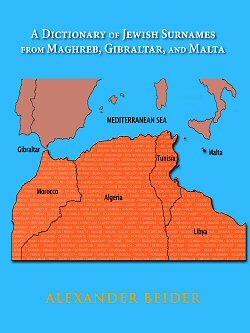 The introductory portion describes the history of surnames in North Africa (Morocco, Algeria, Tunisia, and Libya), Gibraltar, and Malta making a particular focus on the Jewish migrations to these regions from other Mediterranean countries as well as migrations internal to the area covered. By the comprehensiveness of the sample of surnames collected and the rigor of their linguistic and historical analysis (similar to that found in previous works by Dr. Beider), this study dwarfs all previous publications dealing with the Jewish surnames from Maghreb. Copyright © 2017 by Avotaynu, Inc.